Dawns Creations | Let's create something today. So I have just completed a wedding and will share some things with you that we did that might help you. The color scheme of the wedding is Black and Champagne. So when the guests arrive…. are you thinking about what they will see? We had white linens on the tables, with this beautiful champagne sequin runner on it. 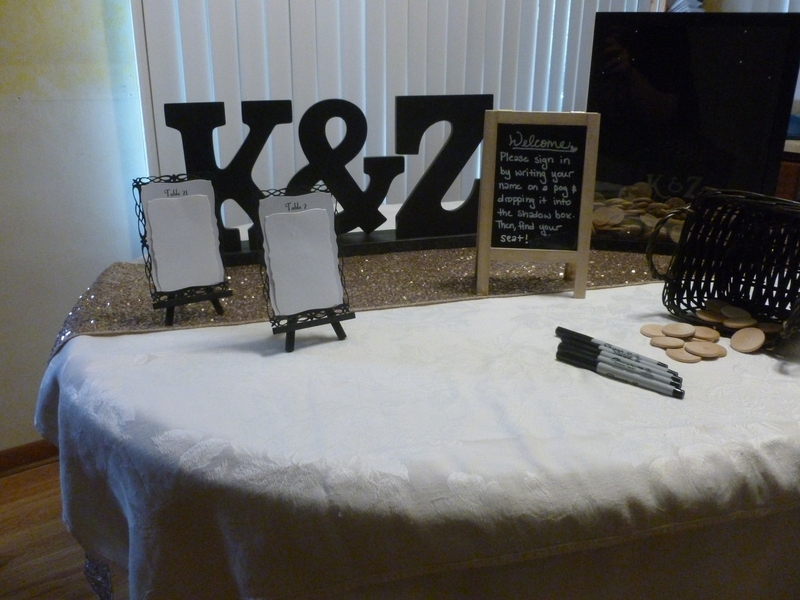 I used a cute chalkboard easel that welcomed guests and gave them further information. We found letters at a craft store and spray painted those in black and attached them on a wooden board. We also used beautiful flower arrangements in the back ground to complete the look. Table Assignments: Instead of making individual place cards we decided to use the easels for table assignments. So that the guests could find which table they were at for dinner. 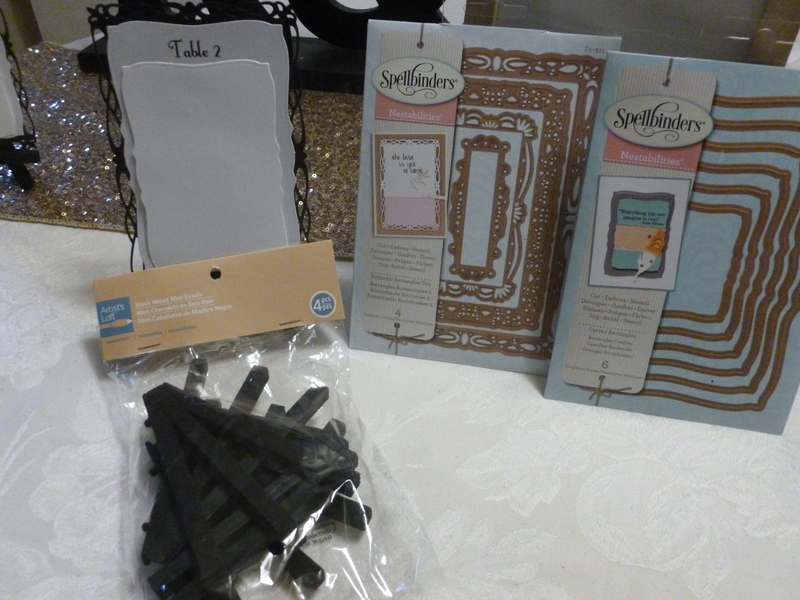 I started with black paper using the framelit that was decorative and the big shot and cut those out. Tip: You might try using a dryer sheet or wax paper on your framelit and run it through first before paper so that the paper comes off easier from the framelit. I then typed table numbers & names in MDS (My digital studio from Stampin’ Up) on shimmery white paper and cut those out. Adhered the white on to the black with glue or glue dots. To make set up easier… I hot glued the back of the black paper to the easel. This way they wouldn’t fall off and I could set them all up pretty quickly and stored them nicely in a small tote. For those of you who have been following me, thank you. I just wanted to let you know that I am not a independent Stampin up Demonstrator any longer. It’s been awhile since I have blogged and will take me a bit to over haul my site. My plan is still to show you how I create items and things that I have come to like. I do still purchase some items with Stampin Up and some items I purchase at my local craft stores. I just recently created lots of items for a bridal shower and wedding invites, programs, table numbers etc. for a wedding and will show you that. I think you will love it! In addition to the Holiday sale starting today, click on the link below for this weeks weekly deals. Whoo hoo! The sales on these products are something you might not want to pass up. 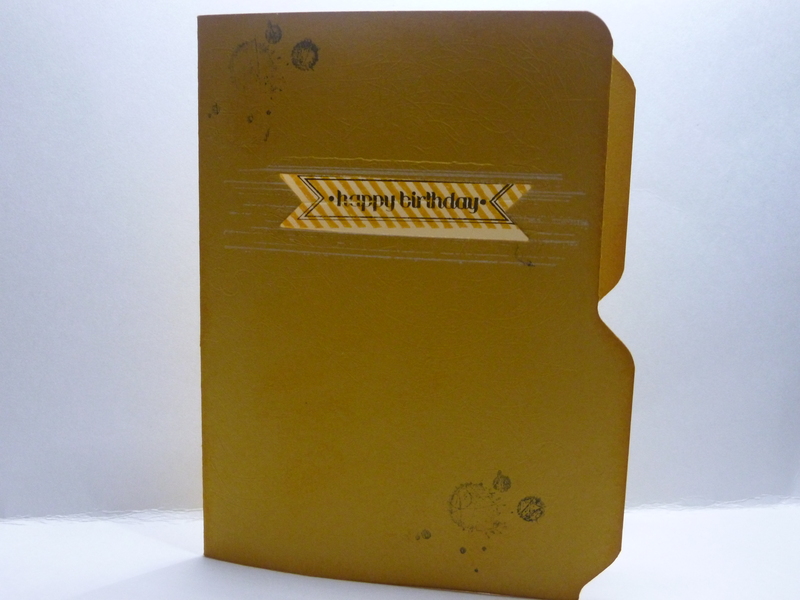 To view the tutorial on how to make a File Folder card, please click on the video below. Thanks for stopping by today and I hope you are having a great day! Today’s card was made for the Blooms and Butterflies Challenge #21. Colors used: Crushed Curry, Black, and Whisper White. First off, I have to say that I had the brown truck come and I’m so excited about my goodies. I used some of them on this project so I might have gotten a bit carried away but I think the project turned out cute. I have found several cards like these on Pinterest and thought I would make mine more like a file folder but you could do this for Thank you cards, Holiday cards etc. Wouldn’t this one be great for a Birthday card at the “office” or change the greeting for Secretary’s Day or Bosses Day? To start: I used a piece of Crushed Curry cut 8 1/2 x 5 1/2″ folded in half. 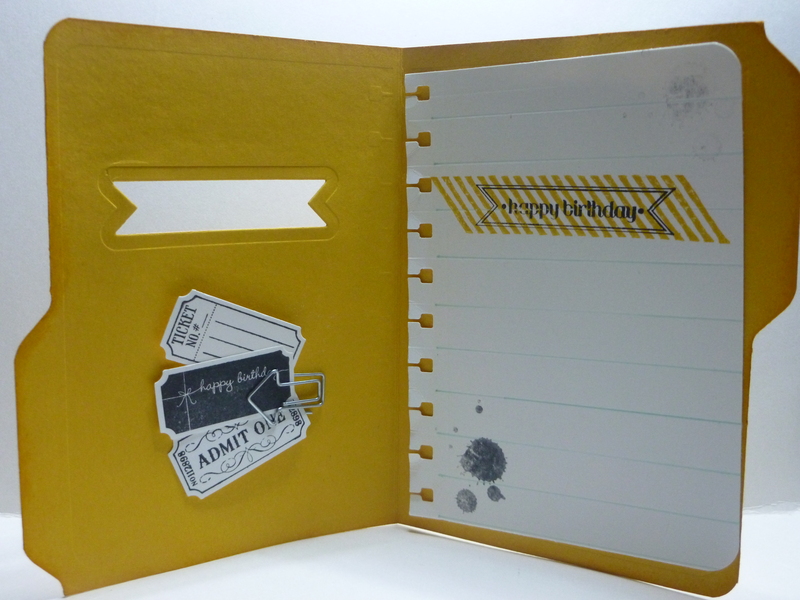 Used my envelope punch board to punch out at the top left of the card. Then I moved my cardstock over to the left where it was marked at 3″ and punched the cardstock again. Where the valley is at that punch, I then trimmed off from the valley out so that it made a straight edge. Repeat the same process on the other side of the fold if you want 2 tabs. I also took a piece of whisper white paper and created my “sheet of paper” for the inside. Cut to the size you want and scored lines across and then I went over the lines with a Pool Party marker so that it looked like a torn piece from a spiral notebook. To finish, I did use a retired punch to get the spiral look along the side. 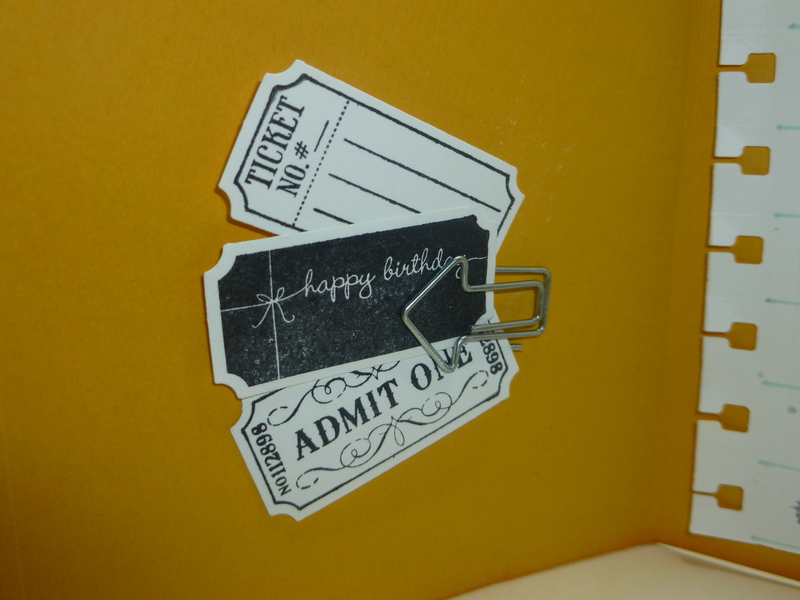 I also took some whisper white and stamped and punched out the tickets and attached them with a paper clip. To finish off the card, I used the grunge stamp set to make it look like ink dumped on the file folder and aged it by sponging the edges of the file folder. I also used a framelit die to cut out for my greeting. You could even use one of the brown inks (Baked Brown Sugar etc.) to make it look like coffee spilled. Wait that would never happen at the office, would it? To see the rest of the design teams creations click here. 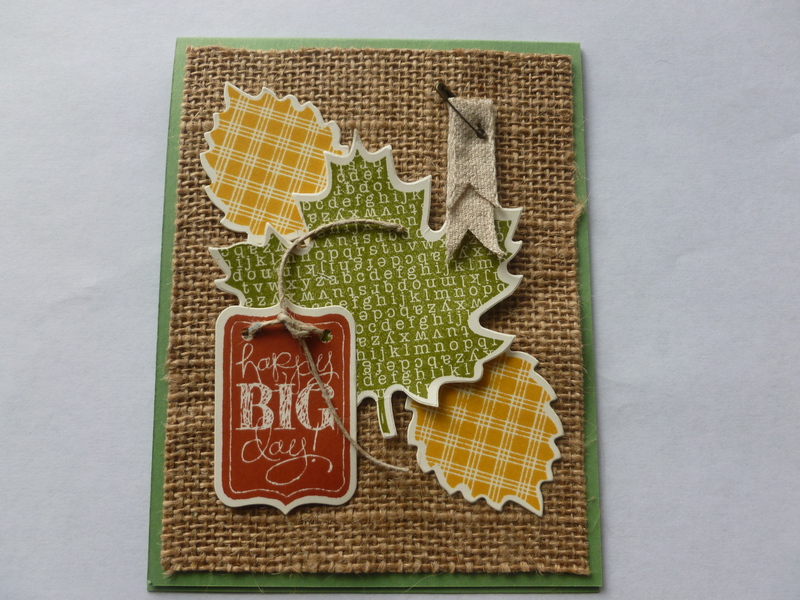 To View the features of the Stampin’ Up! Trimmer, please see the video below. To View the Rotary accessory to the Stampin’ Up! Trimmer, please see the video below. It’s official-Digital Scrapbooking Day 2013 has arrived! And with style we might add. So, what are you still doing here? You’re late for the party. Remember, it lasts all week, with more bloggers, daily deals, challenges, videos, and of course, YOU! •All Best of stamp sets will include 3-5 images, including a never-before seen image, and will be priced at $14.95. 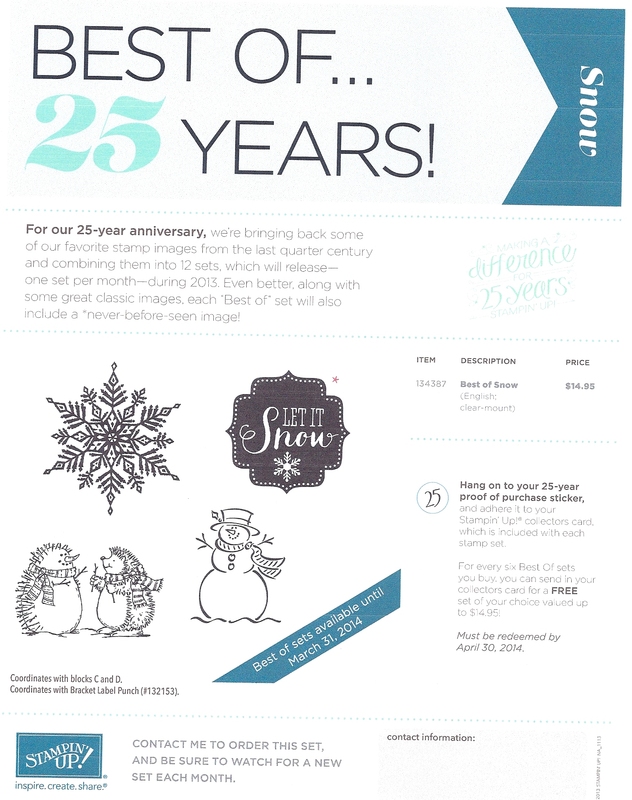 •While we are releasing just one Best of stamp set per month (with a new theme each month), all of the Best of sets will be available until March 31, 2014. •A new flyer will be released every month for each new Best of set. •All Best of stamp sets are available in Clear-Mount only. As a special incentive to collect the Best of stamps, we’re including a collector’s card and 25-year proof of purchase sticker with every Best of set. Collect six stickers, and send it in to redeem a FREE set of your choice valued up to $14.95! November 5, 2013- Weekly Deals. Click on the link below to see this weeks deals. Whoo hoo.